The competition for mobile operating system market share is clearly a race between Google’s Android and Apple’s iPhone. That does not mean, however, that the other alternatives on the market are awful or have nothing to offer. 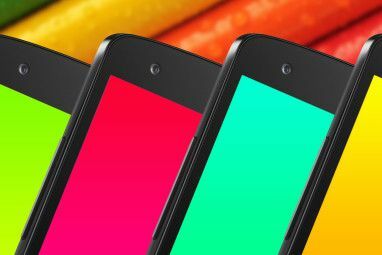 Although not as popular, the smaller mobile OS options have their own unique traits. Windows Phone 7, for example, has a unique “Metro” interface that is excellent in most every way. It’s beautiful, it’s simple, and the large tiles that make up the interface are easy to navigate on a touchscreen. Yet you don’t need to own a Windows phone to enjoy the Windows Phone 7 launcher, thanks to Launcher 7 [No Longer Available]. Android, as I’m sure you know, is a rather open operating system. Google doesn’t put many restrictions on the apps that can be uploaded to the market. One of the most popular app categories is the launcher, an app that changes how Android’s interface looks. 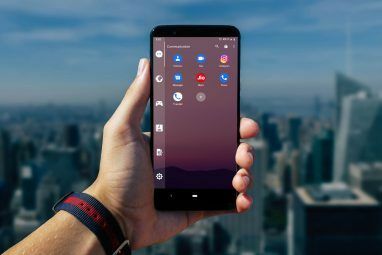 Most of the launchers seek to expand the functionality of Android by offering tweaks to the dock, icons, and other features. Launcher 7, however, completely changes the game. It replaces the typical Android desktop with the tile-based Metro user interface found with Microsoft’s Windows Phone 7 mobile OS. By default, Launcher 7 displays a plain black background with a handful of green tiles, as well as image tiles for music and videos. The tiles send you to familiar places like Gmail, the Android web browser, or your contacts. An arrow in the upper right hand corner of the display offers access to your list of installed apps. These can be viewed either in Metro UI fashion, with a list of apps, or in the traditional icon tile style found on most Android phones. That, as they say, is that. Metro is about minimalism. There’s a reason why Microsoft’s Windows Phone 7 ads focused on “saving us from our phones”. 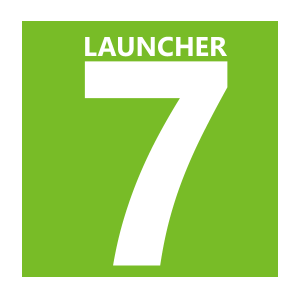 Launcher 7 does not offer anywhere near the same functionality as stock Android, with its number of home screens and icons. But it does offer very easy access to the functions most commonly used. Minimalism does not imply a lack of options, however. 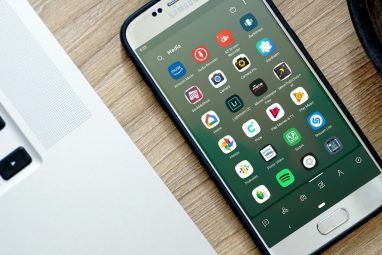 There are a lot of great minimal apps on the Android market, and Launcher 7 offers users some choice in how it is set up. You can access the options by pressing the Android Menu button while you at your home screen and then selecting Launcher 7 Settings. This will give you the option to change your background color, add wallpaper, change the color of titles, alter animation settings, and more. There are not as many options here as you’ll find with, say, Launcher Pro. But there is also a lot less on the display at once. You can also add widgets to Launcher 7 by placing them into tiles. Obviously, this works better with some than with others – widgets with transparent backgrounds tend to work best. You can place the widgets on the colored tile background, or you can make the tile background transparent so the widget floats by itself. Rearranging tiles – those that contain widgets or otherwise – can be accomplished by a long press on the tile. Once the background fades out you can move the tile where you desire. Launcher 7 isn’t for everyone, but it is cool, and it is likely to appeal to anyone who prefers a minimal launcher over one with widgets and icons sprawled everywhere. If you like Launcher 7, you might want to also check out apps like WP7 Contact, which further change the interface of Android to be more like Windows Phone 7.
can I Share this article on my site? With original credits and link back to this article? You can't publish the whole article in its entirety on your site but you can publish one or two lines then link to the original article on this page. I like it. Simple, easy on the ram, and pretty good looking. I switched to this one because my original launcher was being really slow, and this one is at least 10x faster. good all around, and great for anyone who uses 5-10 apps on a daily basis. Why would someone want to make their droid phone like a crappy windows phone? If you want your android phone to look like windows 7: Give away your android phone to someone who likes it, and get a windows mobile phone. But Windows Phone 7 has a limited device selection, and isn't even available on some carriers yet, such as Verizon. Plus, if you thought the Android app market was slim pickins, well....WP7 isn't likely to make you happy.